March 11, 2016 by Ecommerce News. About Cross-border, Marketplaces with tags Germany. 8910 views. Slightly more than half of active traders on Amazon’s German marketplace actually come from Germany. In absolute figures, it concerns about 27,000 German retailers. For comparison: on eBay Germany, there are about 122,000 German suppliers active. One in five retailers who sell via Amazon come from the United Kingdom and more than 9 percent comes from Asia. This is shown by the German website Wortfilter, which did some research on Amazon in Germany. It found out there are a total of 135,000 registered retailers who trade on the German marketplace, but only 55,310 are currently active. And of these active sellers, only 53 percent come from the country where the marketplace is situated. So, that means almost half of Amazon Germany’s third-party retailers are foreign traders. 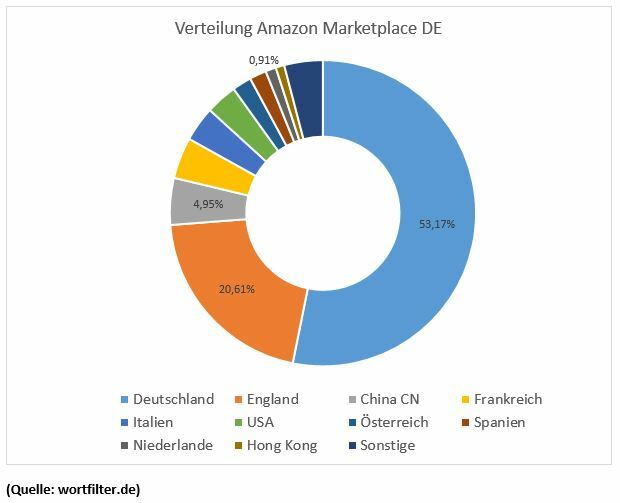 As the graph shows, 20.61 percent of Amazon Germany marketplace sellers are from the United Kingdom. China (4.95 percent) and France are also popular countries where Amazon.de sellers come from. Last month, Sellics estimated that third-party sellers on Amazon Germany generated total sales worth between 10.5 and 12.6 billion dollars in 2014. Researcher Mark Steier, who was the biggest seller on eBay Motors in 2010 and was repeatedly awarded the Platinum PowerSeller Award, emphasized that the figures don’t say anything about the distribution of revenues, but he will explain them in more detail in a next article.